The photoelectric effect was explained by Einstein in 1905 as the absorption of a quantum of energy [A] by an atom and the resulting emission of an electron [B], which can form an electric current. 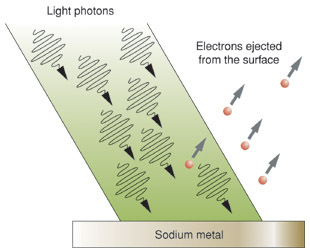 Photoelectric effect caused by light falling onto the metal sodium. The photoelectric effect is the emission, or ejection, of electrons from a substance (usually a metal) as a result of light, or some other form of electromagnetic radiation, falling on that substance. It forms the basis of a number of devices, including the photovoltaic or solar cell, used to produce electricity from sunlight, and the light meter used in photography. The electrons in the outer parts of the atoms of some substances are only weakly held. This means that they can be kicked out of the substance altogether if they absorb enough energy from incoming particles of light, called photons. Two features are distinctive about the photoelectric effect. First there is a threshold energy that the incoming photons must have, which depends on the substance, in order to eject electrons. Second, above, this threshold, the more intense the beam of light, the bigger the current of released electrons, which is why the effect is so useful in light meters. The photoelectric effect can be observed in a variety of different materials, including metals, non-metals, gases, and liquids. Many substances don't display the photoelectric effect unless the incident radiation is more energetic (i.e., of higher frequency) than visible light. In other words, their electrons can only be dislodged by electromagnetic radiation in the form of ultraviolet or X-rays. There are also substances that are only respond to infrared radiation, which carries less energy per photon that visible light. Early experiments in photoelectricity were carried out with two copper plates, placed inside an evacuated glass bulb. One of the plates was illuminated, and the photoelectric current from it was measured. Copper is not as sensitive to visible light as some other metals, such as selenium. In fact, it doesn't respond at all to any visible light, but does give out a photoelectric current when exposed to ultraviolet rays. The threshold of potassium, by contrast, is at a point in the green part of the spectrum. Blue light will produce a photoelectric effect, wile yellow light will not.